We have just launched an array of new products. As always when I introduce a new product I look for 3 things i.e. quality, presentation and a competitive price, believe me this is not always easy to achieve however I do travel and visit lots of producers and in the end I usually end up with what I am looking for. For me this year the star product is the new range of gourmet olives which at £1.99 for 300g (net weight) is a real bargain. The tins of black olives pitted and whole at £0.90 and £0.80 are also extremely good value. The 2 products that have been very well received and we have already had lots of orders for are the elegant square 250ml gift bottle of Arbequina olive oil Las 7 Encinas and the chocolate coated oranges with rum & cointreau. Please also have a look at our fantastic list of pâtés, these are perfect for hampers. "A very special product is our organic honey the producer is so passionate about it that I have decided to give you a bit more information about how his organic honey is made: "The honey comes from the Nature Reserve at O'Courel Ancares in the Eastern mountains of Galicia . The beehives are located in barely accessible places in the mountains, pristine habitats far away from conventional agriculture. The bees are not fed with sugar, the hives do not receive any chemical treatments and they stamp and use only their organic certification which guarantees complete control of the traceability of the products"
Come to our Spanish market where you will be able to sample and purchase olive oils and Spanish delicacies from El olivo and superb wines from Calduero Wines. In our cinema room, come and discover cult, rare and classic Spanish feature films and powerful Latin-American short film sessions curated by CinemaAttic. Our music room will be dedicated to spanish and latin music, from Rodrigo & Gabriela, to Gotan Project. Any old favourites you would like to rediscover on our system? Let us know! Live music between 1 and 3pm! Before Dr. Torchia can recommend any of my products, they have to be sent to a laboratory in London to be analysed to make sure that they are completely natural and free of chemicals/preservatives etc. 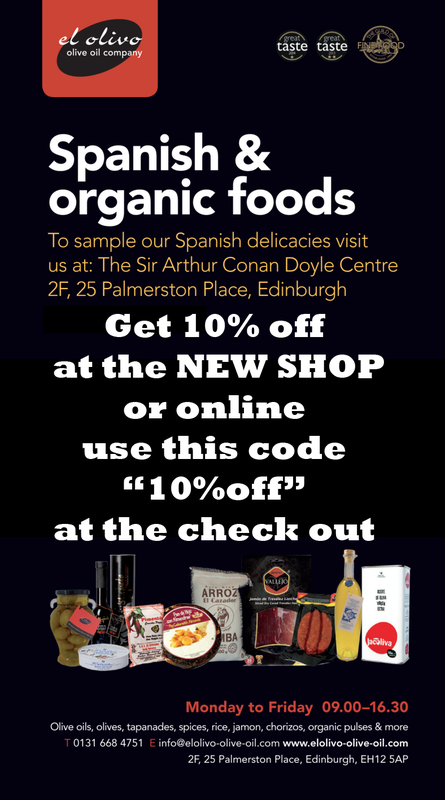 We are working together to bring an organic range of products alongside my "typical Spanish products". Available now are a new organic range of lentils, chickpeas white beans, honey and tomate frito. Dr Torchia has already moved to his new consulting rooms at the Arthur Conan Doyle Centre. He will be taking over the very elegant tea room in February. He will use his knowledge about food and diet to devise alongside his chef a menu that will be both innovative and healthy. El Olivo is supporting a great local charity Itâ€™s Good 2 Give. The Spanish Paradores are, luxury hotel accommodation in Castles, Palaces, Convents, Monasteries, Fortresses and other historic buildings at very competitive prices The building is often part of the heritage of Spain although there are some modern hotels in a spectacular location. Many of them are in smaller medieval towns and villages first inhabited long ago. The group is renowned for the high standard of service given to guests while the prices are lower than expected especially if you take advantage of the many promotional offers . As the majority of you already know Ian had a heart attack on the 13th of December. He has recovered and he is doing well but he will not be coming back to EL Olivo. Sales are now being split between my-self and John although it has been mainly John doing it for the last few months .That may continue this way as I develop other areas of the business (more of this later). John's wife Joan comes in a couple of times a week to help with administration. 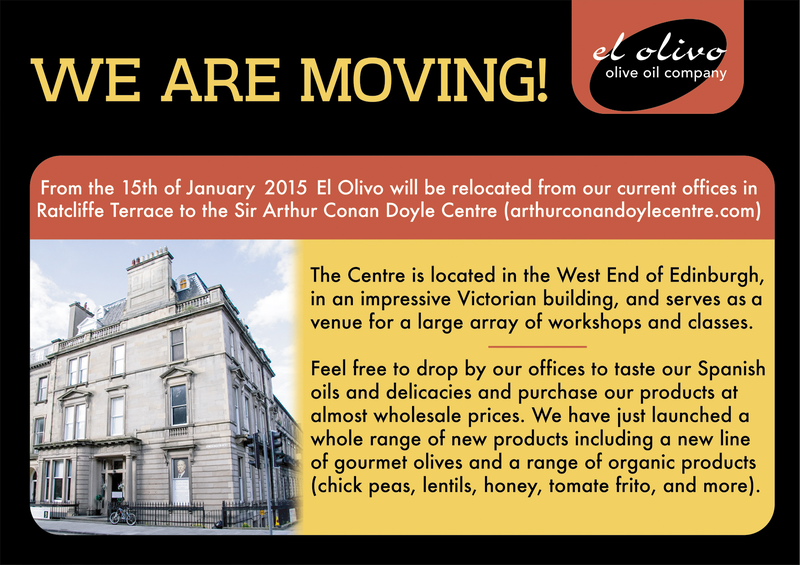 We are also moving premises, after over 5 years at our current offices we have decided to move to The Arthur Conan Doyle Centre in the West End of Edinburgh. This is a stunning building where a lot of activities take place and is much easier for our retail customers to find us. Our warehouse will remain in Glasgow. There are many ways you can use olive oil in your meals and it doesnâ€™t always have to be as a dressing or a dip on the side. When you opt to buy olive oil online from us you should make the most of its quality and taste by incorporating it into a wider range of meals. Below are three exquisite recipes which work wonderfully with any of our extra virgin olive oils. A classic Italian meal which you can enjoy using an olive oil of your choice. 2. Heat your olive oil in a frying pan and add garlic, allowing it to fry for 1-2 minutes, spreading the flavour amongst the oil. 3. Add two tablespoons of water to the pan and then mix in the fresh chilli. Season well and continue to stir and cook for 3-4 minutes. 4. Once the spaghetti cooked drain it quickly and whilst still wet add it to the olive oil sauce, tossing it to coat it entirely in the sauce. Finish with your chopped parsley. Imagine youâ€™re sat on a Spanish terrace, tucking into this zesty and fresh creation. 1. Squeeze lemon juice over the prepared squid including the tentacles and leave it for 5 minutes to settle. Drain any excess liquid as the squid will have absorbed the majority of the juice. 2. Heat the olive oil in a frying pan and add in the garlic and the zest of the lemon, slowing cooking it and increasing the heat gradually. When it is very hot add in the squid and fry in the hot oil, moving it slowly around the pan to ensure it only takes on a little cover. It should take no longer than 2 minutes to cook. 3. Season the squid and serve straight away from the pan with lemon wedges available for an extra refreshing twist. You could add a green salad or pitta breads on the side for something extra. Adding olive oil to your desserts adds a rich and velvety texture youâ€™ll soon learn you canâ€™t live without. 1. Melt the chocolate over a pan of simmering water, stirring to ensure a thick, smooth paste. Then leave it aside to cool a little. 2. Stir 30g of sugar into the five separated egg yolks and add this slowly into the chocolate, mixing it together. 3. Slowly and steadily add the olive oil and then mix in the brandy. 4. Beat three egg whites together with the sea salt to create soft peaks, finally adding in the remaining 50g of sugar until the mixture is glossy. 5. Fold the whites into your chocolate mixture until all white streaks have disappeared. 7. After 20 minutes they should be set and ready to serve, simply top with a little extra olive oil and some sea salt to taste. You can now buy much of the El Olivo Spanish Food Range at The Good Food Network, who stock an award winning of French & Spanish Fine Foods. UK Wide Delivery & Â£5 loyalty vouchers & excellent service. Welcome to this yearâ€™s new product range. Welcome to this yearâ€™s new product rangefrom el olivo, your exclusive selection of the finest olive oils, vinegars and speciality products from Spain. This year I am very excited to be offering an array of new products exclusively selected with you my customers in mind. One of my "jewels" find has been the baby peppers stuffed with olives, they are absolutely divine, honestly, please try them, you will not be disappointed. The turron tort is extremely good value as well as the Â£3.50 bottle of Garcia de La Cruz extra virgin olive oil. I am also thrilled about our organic cherry sun-dried tomatoes their flavour is amazing!! As always El Olivo promises passion and quality with every taste/ I hope that you will enjoy discovering these products as much as I did. We will be exhibiting at the Olympia Fine Food Fair LondonÂ 5th â€“ 7th September Â Stand 228 Please come and join us for a glass of wine and some olive oil tasting. 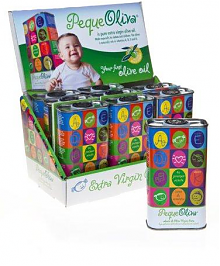 Beautifully presented 250ml metal tin of Kids Extra Virgin Olive Oil Full of goodness for the younger ones. Click here to purchase or find out more about this product. 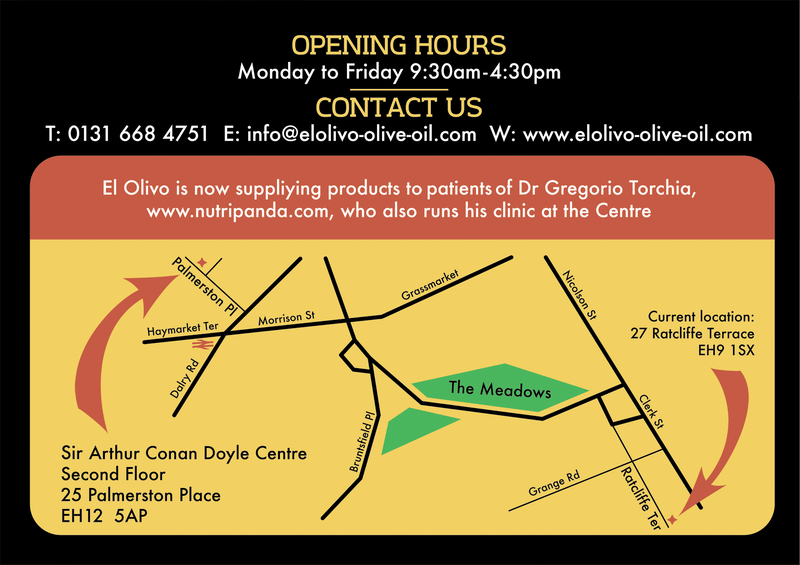 Come visit El Olivo at our stand for some great new products. 24 â€“ 26 January at the SECC in Glasgow. Chorizos Caseros that do not need refrigeration and have a shelf life of 12 months. Range of sherry vinegar sauces and salsas. NEW FOR 2009, Gazpacho Andaluz in a carton, it does not require refrigeration! Andalusian Gazpacho has been for centuries a staple ingredient of the Mediterranean diet. Highly aromatic and full bodied with a light orange colour, it is made in a mortar with tomato bread, extra virgin olive oil, vinegar, salt, garlic, cucumber and pepper. Thanks to these ingredients it is a food very rich in vitamins, vegetable fibre, oleic acid and mineral salts. It is a natural part of a balanced and healthy diet. Our gazpacho is made in the heart of the Guadalquivir valle, the home of the gazpacho, using the best traditional recipe of Andalusian gazpacho. The result is a product that the finest palates will be unable to distinguish from gazpacho made at home. According to a recent study by the Agriculture Research Service of the US Department of Agriculture (USDA) consuming gazpacho significantly increases the amount of vitamin C in the blood while reducing molecules linked to stress and illness. The level of vitamin C in volunteers who consumed gazpacho were found to have increased by 22% in the case of women and 27% in the case of men and the levels of uric acid and other stress molecules in the study group were significantly reduced. Tomato, the main ingredient of Gazpacho, is an outstanding source of lycopene, a powerful antioxidant linked to lower risk of heart disease, macular degeneration and several types of cancer such as those of the prostate, lung, stomach and bladder. When tomatoes are heated the lycopone turns into a form that it is more bio-active and easily assimilated by the body, this is why consuming products that contains "cooked" tomato is internationally recommended. Our gazpacho is made using the best and latest methods that allow the product to be processed gently while guaranteeing a longer shelf life. The result is what we believe is the best gazpacho in the market with a taste fit for the most demanding gourmets. 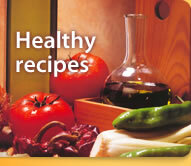 TRY IT AND LEARN THE TRUTH ABOUT GAZPACHO!!! Also a a laminated card will be sent detailing the health benefits of olive oil. El Olivo exhibited at the recent Glasgow Specialty Fine Food Fair where as usual a large number of visitors tasted not only our olive oil but also all our new products. Winners without a doubt were our black olive pate with chocolate and our roasted peppers. DISCOVER EXCLUSIVE NEW TASTES FROM EL OLIVO AT THE OLYMPIA SPECIALITY FINE FOOD FAIR, Earls Court, 7th, 8th and 9th of September. This is an exciting year for lovers of fine foods from Spain. I have travelled extensively to find you some of the most exquisite tastes from my homeland. The result is a delicious and tempting new range that offers the passion and quality you can expect from El Olivo. Come to visit us to stand 506 to discover award winning products such as olive oil chocolates and roast peppers, or try olive pates with tofu, olive oil with tapenade or walnuts with honey. Throughout history, chocolate and olive oil have both been regarded as natural aphrodisiacs. These two seductive tastes have now been brought together with our award winning olive oil chocolates. Delicious quality chocolates with a melt-on-the-tongue olive oil centre, they are the ultimate way to indulge your senses. For more taste sensations, try the irresistible red wine and white wine chocolates. 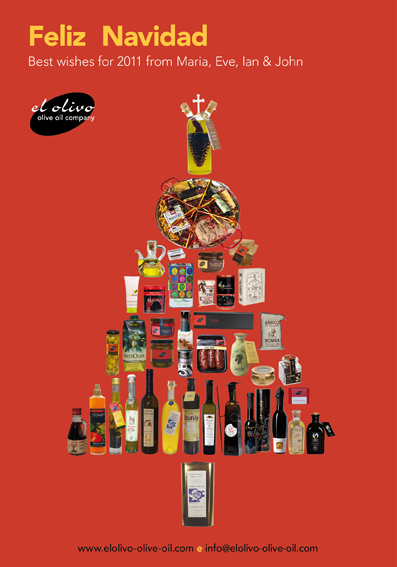 Our charming new range of olive oil gifts will inspire your friends and family to enjoy the finest tastes from Spain. Beautifully presented in a choice of elegant boxes, jars and baskets, these gifts will bring a touch of luxury to a loved oneâ€™s kitchen. El Olivo exclusively offers you a range of sensual olive oil based beauty products. The olive oil soap will be kind to your skin, while our organic range of olive oil body lotion, hand cream and shampoo will take complete care of your beauty routine. The natural qualities of olive oil were first discovered by the ancients, with the Egyptians, Greeks and Romans all enjoying its benefits to skin and hair. The high level of antioxidants and oleic acid combine to create a hydrating affect which fights off free radicals, helps regenerate skin cells and leaves a smooth and radiant look. Now, El Olivo introduces an exclusively sourced selection of beauty products produced using our Gold Award Winning El Lagar Del Soto olive oil, bringing the natural qualities of the olive fruit to your cosmetic bag. OUR ORGANIC EXTRA VIRGIN OLVE OIL EL LAGAR DEL SOTO HAS WON GOLD FOR A SECOND YEAR. OUR GARLIC STUFFED QUEEN OLIVES HAVE ALSO WON GOLD. WE WERE LATE GETTING THE MAJORITY OF OR NEW PRODUCTS FROM SPAIN AND WE WERE ONLY ABLE TO PRESENT TWO FOR THIS YEAR''S AWARDS: THE OLIVE OIL CHOCOLATES AND THE ROASTED PEPPERS AND BOTH OF THEM HAVE WON GOLD!!!! WE ARE AND WE WILL CONTINUE TO BE AN OLIVE OIL SPECIALIST BUT WE ARE ADDING TO OUR WONDERFUL RANGE OF OILS, OLIVES AND VINEGARS A SELECTION OF HIGH QUALITY, UNUSUAL AND DELICIOUS PRODUCTS THE MAJORITY OF WHICH WILL BE SOLD WITH OUR OWN LABEL. THREE NEW EXTRA VIRGIN OLIVE OILS WILL BE ALSO ADDED TO OUR RANGE, wWE WILL HAVE 11 DIFFERENT EXTRA VIRGIN OLIVE OILS. Organic and non organic flavoured Oils. A cosmetic line including olive oil body lotion and hand cream. 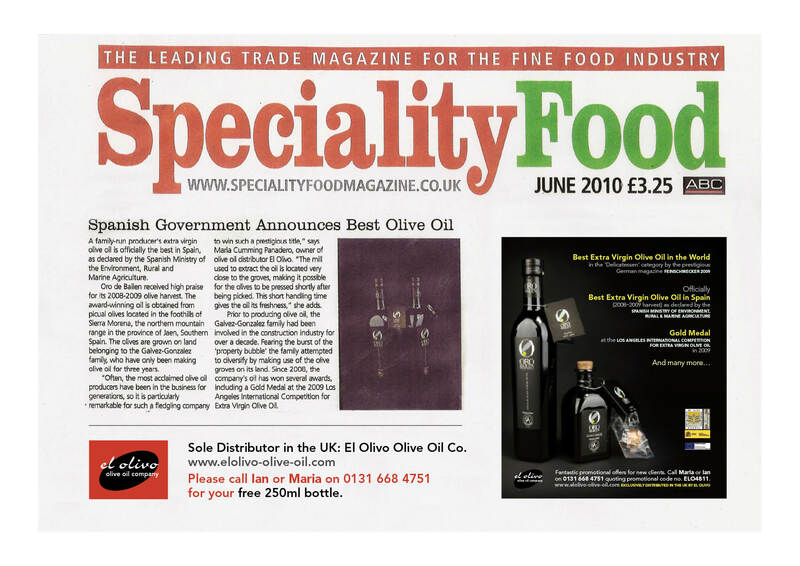 EL OLIVO OLIVE OIL CO is launching a whole range of spray vinegars in the coming weeks which will be featured in next month''s FINE FOOD DIGEST. 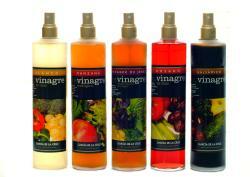 Spray vinegars are definitely gaining popularity due to their practicality, as it is easy to control how much you want to use. 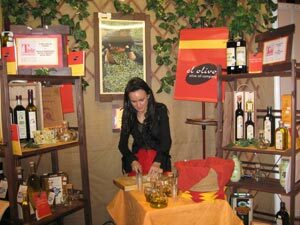 EL OLIVO OLIVE OIL CO WILL BE XHIBITING AT THE ABOVE SHOW. WE WILL BE TASTING OUR GIANT AND POPULAR QUEEN OLIVES AS WELL AS ALL OUR OLIVE OILS. PLEASE COME AND JOINS US FOR A GLASS OF WINE ON STAND G95. 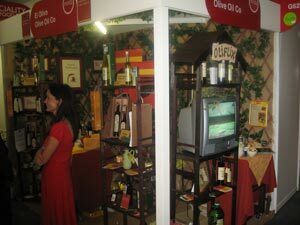 EL OLIVO WILL BE LAUNCHING AT THE OLYMPIA FINE FOOD FAIR IN SEPTEMBER A WONDERFUL RANGE OF OLIVES AND GUESS WHAT? 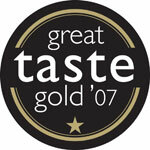 WE HAVE NOT EVEN LAUNCH THEM YET AND WE HAVE ALREADY WON A GOLD MEDAL AT 2007 GREAT TASTE AWARDS!!! OUR QUEEN OLIVES STUFFED WITH CAPERS HAVE WON GOLD AT THE RECENT GREAT TASTE AWARDS. 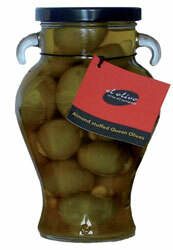 WE WILL ALSO HAVE QUEEN OLIVES STUFED WITH ALMONDS, GARLIC, JERKINS ETC. THE OLIVES WILL BE AVAILABLE IN 340 gr BEAUTIFULLY PRSENTED JARS, IN 5 KILOS PLASTIC TUBS AND IN 5 KILOS GLASS CONTAINERS. 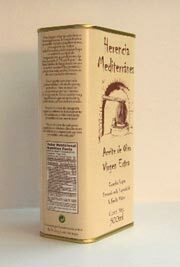 This is a wonderful fruity, sweet organic extra virgin olive oil produced by the Damian - Corchero Family who have been producing olive oil since 1868. The type of olive used is Manzanilla which matures at the end of September, much earlier than the rest. Available in 500ml elegant metal tins (see below) priced at Â£3.75 and 250ml bottles priced at Â£3.50. 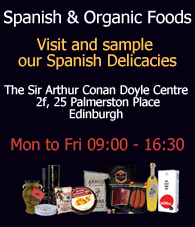 EL OLIVO WILL BE LAUNCHING AT THE EDINBURGH FINE FOOD FAIR IN MAY A NEW EVOO IN AN ELEGANT 500ML METAL TIN. HERENCIA MEDITERRANEA THE BEST SELLING AWARD WINNING EVOO FROM LA MANCHA CENTRAL SPAIN WILL NOW BE AVAILABLE IN 500ML METAL TINS. THE TYPE OF OLIVE USED WILL BE HOJIBLANCA. PRICE Â£2.99. 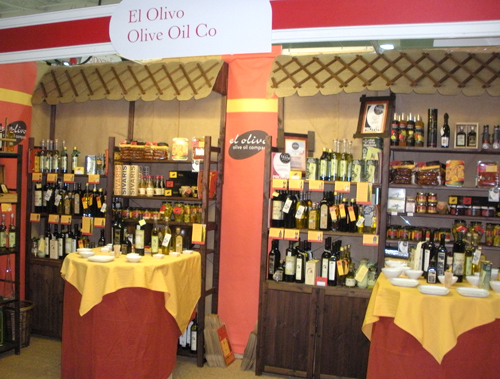 EL OLIVO OLIVE OIL CO WILL BE EXHIBITING AT THE EDINBURGH FINE FOOD FAIR ON SUNDAY 13TH AND MONDAY 14TH OF MAY. WE WILL BE SHARING OUR STAND WITH CARLA WINCHESTER WINES WHO HAS A SUPERB RANGE OF SPANISH WINES FROM LA MANCHA, INCLUDING HER GOLD WINNING ROSE. DURING THE SHOW, EL OLIVO WILL TAKE PART IN ONE OF THE WORKSHOPS FOR GREAT TASTE AWARDS GOLD WINNERS. WE WILL BE ANSWERING QUESTIONS BOTH FROM THE AUDIENCE AND FROM MIKE MIKEWORTH FROM THE GUILD OF FINE FOOD RETAILERS ABOUT OUR GOLD MEDAL WINNER OLIFLIX. PLEASE COME AND JOIN ON STAND 194 FOR A GLASS OF WINE AND SOME OLIVE OIL TASTING. I am delighted that OLIFLIX was been awarded with the gold medal in the first cold pressed category at the recent Great Taste Awards. I am also very pleased that HERENCIA MEDITERRANEA has been awarded the bronze medal for the second consecutive year. This is a light fruity olive oil good for both salads and cooking. El OLIVO OLIVE OIL CO will launch at the EDINBURGH FINE FOOD FAIR, its new award winning organic Extra virgin olive oil: EL LAGAR DEL SOTO which was voted best Organic Extra virgin olive oil in 2005 by the Ministry of Agriculture. 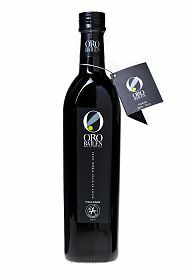 This is a wonderful fruity - sweet Extra virgin olive oil produced by the Damian- Corchero Family who have been producing olive oil since 1868. The type of olive used is Manzanilla which matures much earlier than the rest, (end of September). 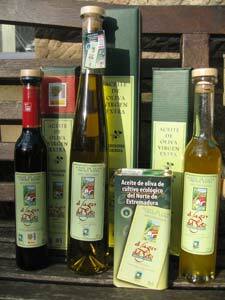 With this latest addition El OLIVOâ€™S range is increased to seven different Spanish Extra virgin olive oils. This will allow our customers to embark on a journey of different flavours and aromas around the different regions of Spain.